In this dreamy and seductive entree into the magical city that is New Orleans, author Debra Shriver, a twelfth-generation Southerner, Francophile, passionate preservationist and jazz devotee creates a book that is part love letter, part scrapbook, and gives readers a rare tour behind courtyard walls and private gates of this enigmatic city, which is often considered the Paris of America. Yes, yes. Those things are true. This gorgeous book is indeed part love letter, part scrapbook, part courtyard tour. But what you really need to know is that I read the thing from cover to cover. The photographs are gorgeous, of course -- and I am usually into coffee-table books like this just for the pretty pictures -- but the text is just as captivating. Each chapter tells a different story of New Orleans -- the Mardi Gras Indians and the Zulu parade; falling in love with the city; choosing and decorating a a house; throwing a magnificent party, complete with recipes; the incredible musical history of the city; and fun sidebars with information about things like correct party attire and local traditions. It takes a special kind of person to choose New Orleans over most of America. You have to be the kind who can dance at a funeral and spend thousands of dollars on plastic trinkets just for the privilege of throwing them off a tractor-driven float to complete strangers. Yep. Sounds about right for me. And there is, of course, an entire chapter devoted to the monogram, which caused me to stand up and salute my Leontine Linens. 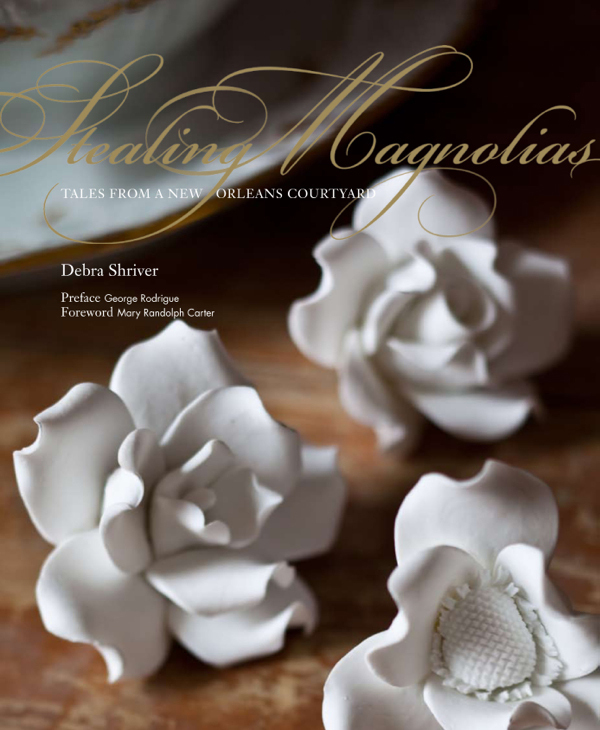 All photos from Stealing Magnolias: Tales from a New Orleans Courtyard by Debra Shriver, copyright © 2010, published by Glitterati Incorporated. I did not need to be sold on New Orleans, of course -- it's my favorite place on this entire planet, and I plan to one day live there. But I leave you with this warning: if you buy this book, you will likely find yourself, one day, as my neighbor.